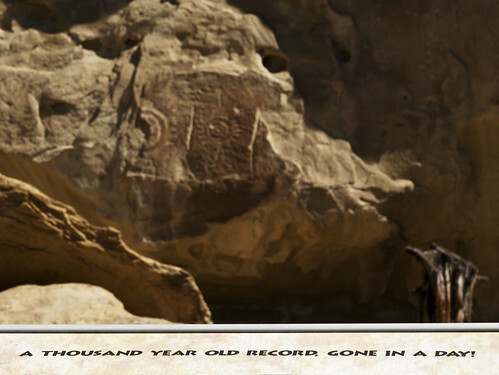 A Thousand Year Old Record, Gone in A Day! Rock art is thought to represent the spiritual expression of people who lived here long ago. The fremont people who lived here from about AD 500 to AD 1100 left symbols on the rock which had tremendous meaning to them. The Shield site remains an example of what vandalism can do to a once beautiful and interesting archaeological site. Parties, camping, tree cutting and outright deliberate destruction of the rock art have destroyed this site. No scientific knowlege will ever be gained here. No quiet enjoyment is possible. And, no one can feel anything but sorrow while viewing the remains of symbols left by people over a thousand years ago.